Modern Twist on Bonnie Hunter's Grand Illusion: "Construction Zone!" 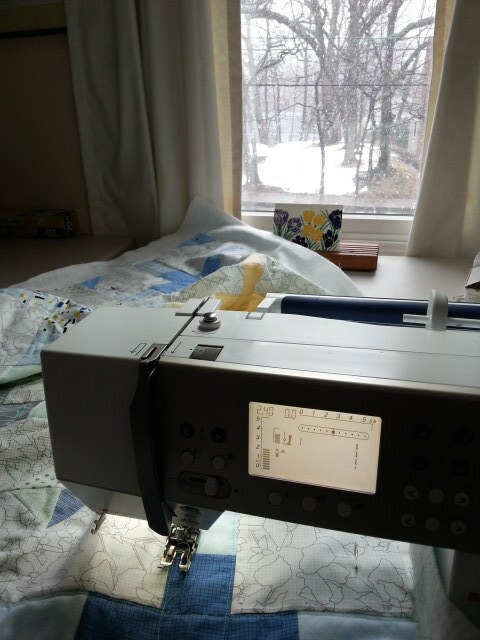 Bonnie Hunter's Grand Illusion Winter 2014 Mystery Quilt was designed to be a queen size quilt. 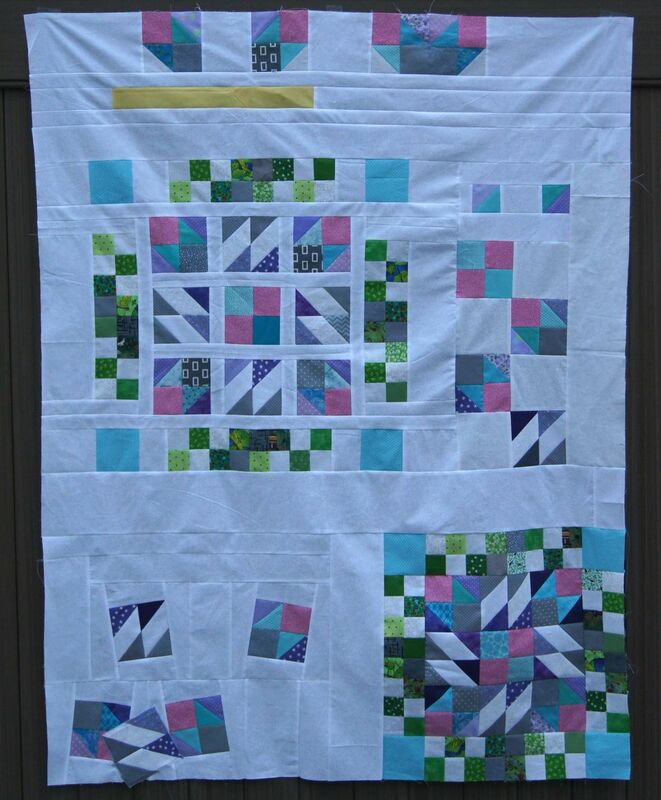 As I was assembling the quilt I decided to make a twin size quilt by omitting one of the vertical rows of blocks. That left me with lots of partially completed orphan blocks. 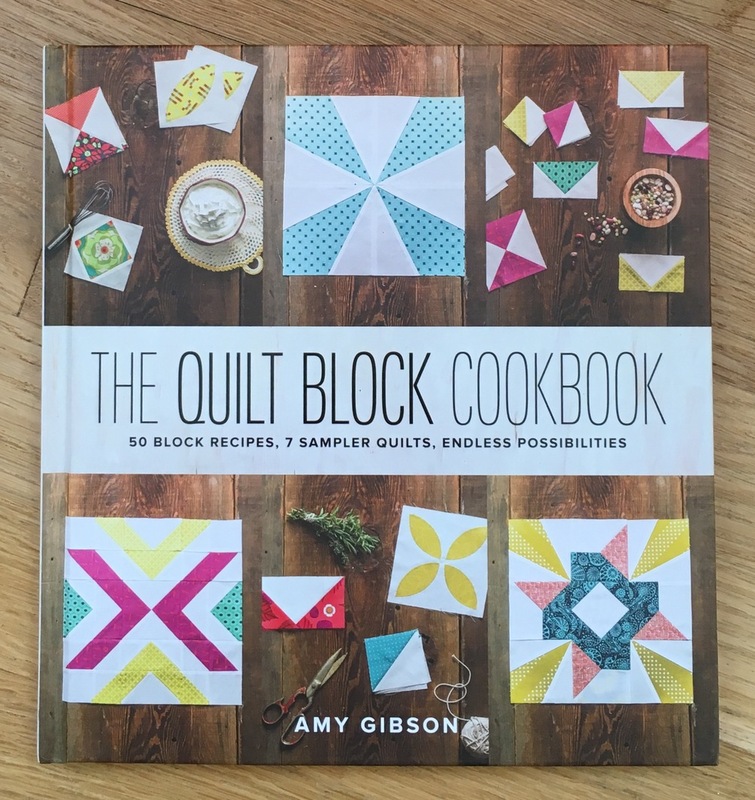 I had toyed with the idea of changing the quilt to try to give it some modern aesthetic, but decided that was just too difficult to do with a mystery quilt. I wasn't willing to wait until the reveal to start sewing. 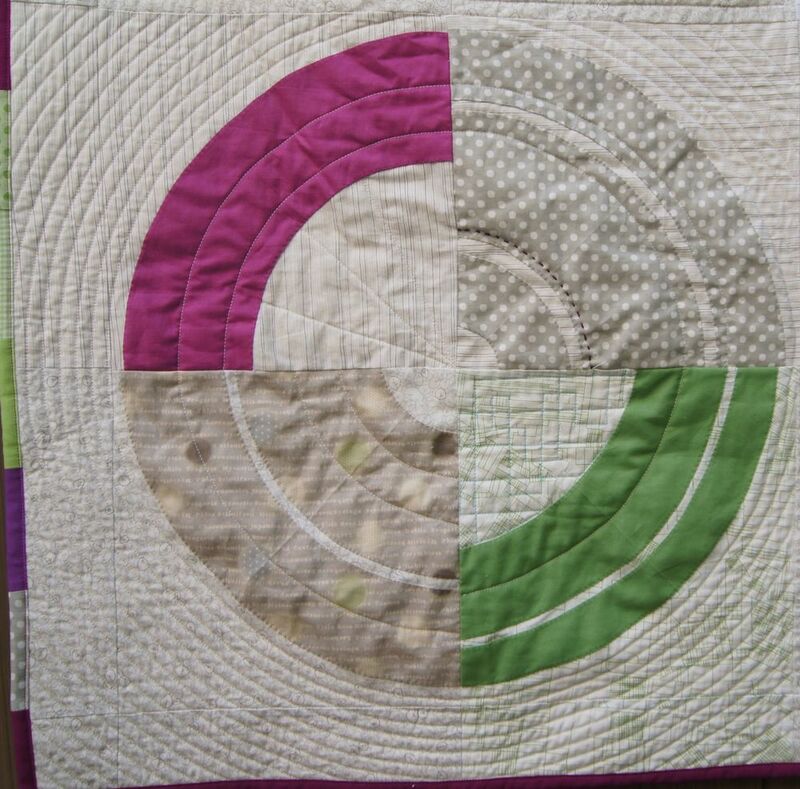 However, my stack of orphan bits, pieces and blocks gave me the perfect opportunity to create a Modern Quilt. I call this design "Construction Zone." 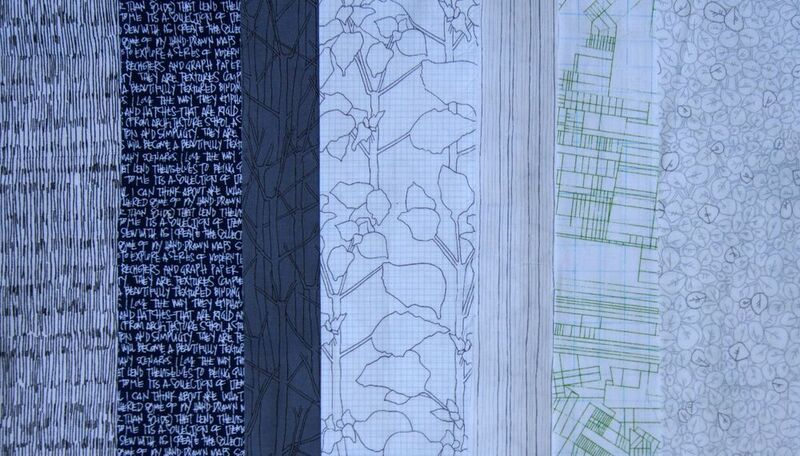 I took the elements of the Grand Illusion quilt and laid them out the way you see them when you are sewing a Bonnie Hunter quilt together. 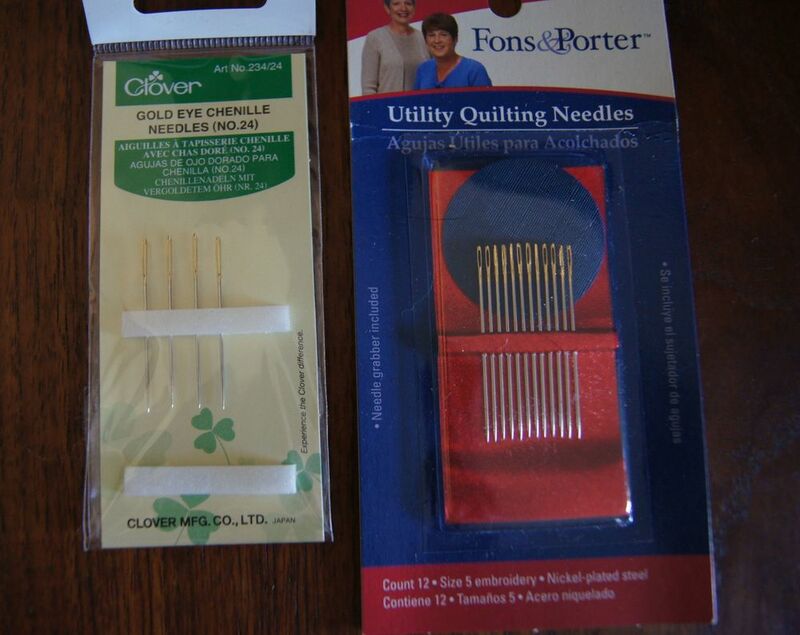 On the top row are the component blocks for the outer border on the left and the border unit on the right. 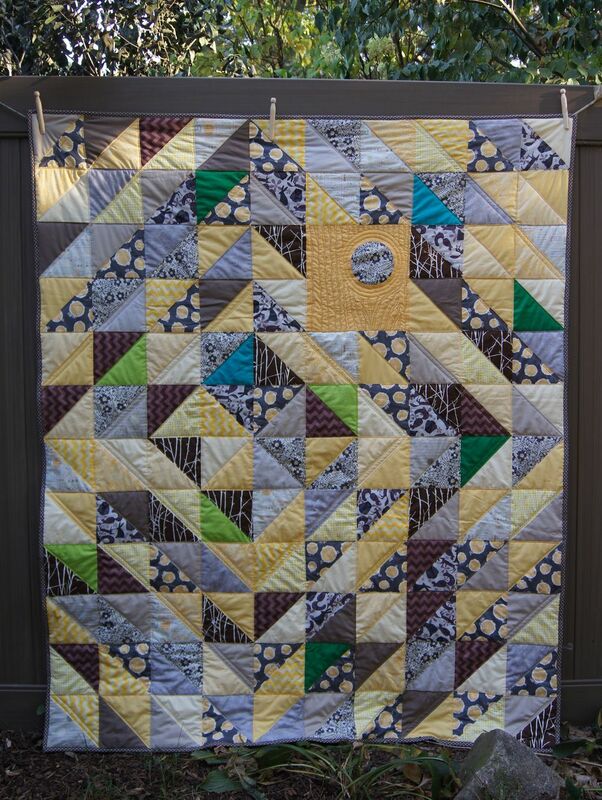 Below that is the inner border, yellow on my quilt. In the middle of the quilt on the left are the units set out they way the final block and it's green checkered border will be sewn together. In the middle right are some of the individual components of the focus block. The completed focus block with its border is at the bottom on the right. On the left are block units falling off the sewing table and piling up on the floor! (It always happens at some point in a project this complex)!! 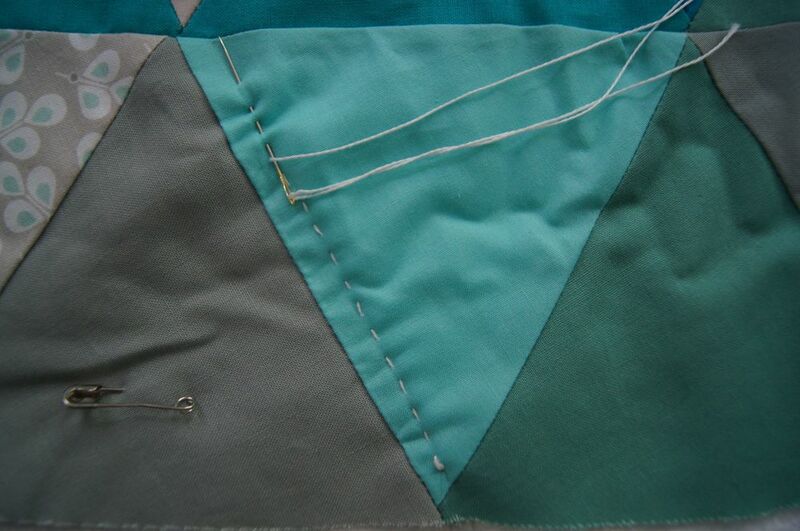 One of the fallen blocks is attached by machine appliqué. The corner of that block will extend over the border of the finished quilt. This was so much fun to make. I put the pieces up on the design wall but the assembly was all improv. I sewed pieces together, measured and cut and sewed some more. 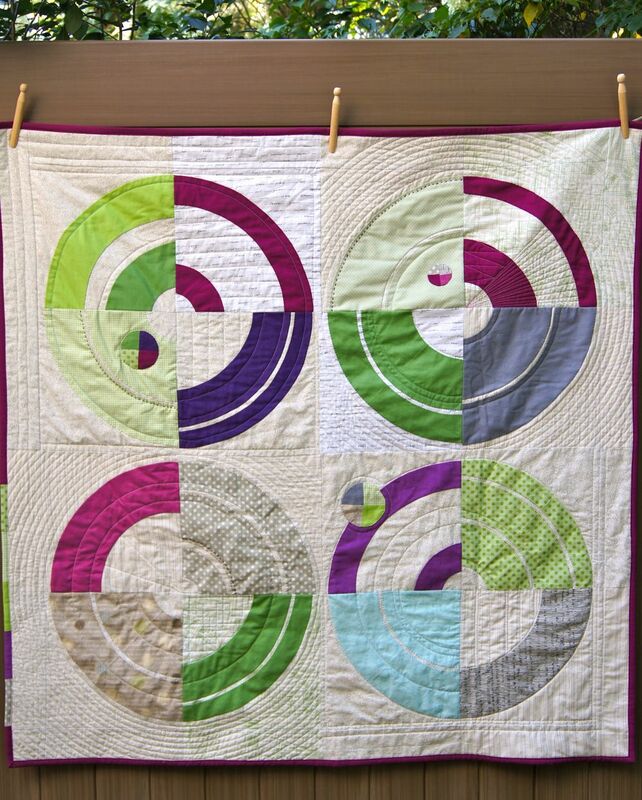 I'm giving away the "real" Grand Illusion quilt so it's great to have this lap size quilt to keep. And it makes me smile! Here's my Improv Log Cabin #1 quilt top. This has been my "take along" project this summer. I've kept all the fabric and completed blocks in a bag. If I'm going over to a friend's house to sew, I've been able to grab the bag and my sewing machine and head out the door. It's been nice not to have to think about which project to take or needing to gather up the necessary components for a project. I originally thought I was going to make a bed size quilt. But this is a busy quilt. Very busy! So i've decided to make 2 smaller quilts. I think they'd be great for floor time play for a baby. Lots of interest and visual stimulation! This is Improv Log Cabin #1. 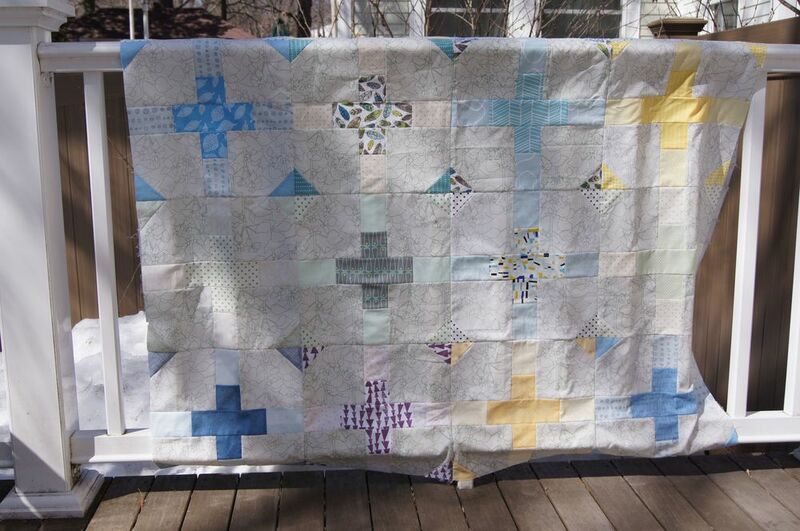 The construction of the log cabin blocks in this quilt is somewhat traditional. The yellow square (there is one in every block) is mostly near the center of these blocks and the block has been built around it. Improv Log Cabin #2 has log cabin blocks with longer strips. I haven't put it on the design wall yet, but I think it will have a different feel.